Massachusetts State Police say they have arrested the driver of a car in connection with a school bus crash investigation after determining that she was under the influence of alcohol. Authorities identified the driver as Christy Gilpatrick, 27, of Warren, Rhode Island. They say this is the second time she has been charged with an OUI. State police responded Saturday night to a school bus crash with injuries on Route 24 southbound after receiving multiple 911 calls about a serious crash. The accident was south of exit 11 in Berkley. The crash is still under investigation and police have not yet determined whether Gilpatrick caused the crash. Authorities say this is the second time Christy Gilpatrick has been charged with operating under the influence. Father Ted Brown of the National Shrine of Our Lady of La Salette in Attleboro, Massachusetts says the bus left from there. "It kind of just takes the air out of you," he said. “We had a big concert here that about 1,000 people came to." Thousands of people visit the shrine every year to see the holiday lights. "Sadness. Great, great sadness," Brown said. "I'm concerned for all the people who were injured, and I know it varies from minor injuries to some serious injuries." As authorities continue to review and investigate the crash, they issued an update on Sunday evening. State police said more victims than initially thought suffered serious injuries, including multiple fractures. Upon further review, they found that several people, including some children, suffered serious injuries. One child with serious injuries was transported from Rhode Island Hospital to a Boston hospital for additional treatment. Many victims remain hospitalized, the statement said. State police said total number of people on the bus has been updated from 25 initially to 23 adults and children; however, fire officials in Berkley said a total of 30 people were taken to five hospitals in two states. The bus was owned by First Student, Inc., a bus company in Tiverton, Rhode Island. The bus passengers were First Student employees and their families and friends who went on a company trip. "I would just like to thank all of the mutual aid departments as well as municipal and state police. Last evening was a total team effort," Fournier said in a statement on Sunday. "It is the kind of situation we train for and sit in workshops and prepare for, but you really come to appreciate the value of all that planning when see it unfold before you." According to State Police, people ranging in age from adult to young children were on the bus. The bus went off the road off the right shoulder and into the woods. It did not roll over. All occupants are accounted for and no other transports are believed to be serious injuries, police said. They were transported with minor injuries or for precautionary reasons. 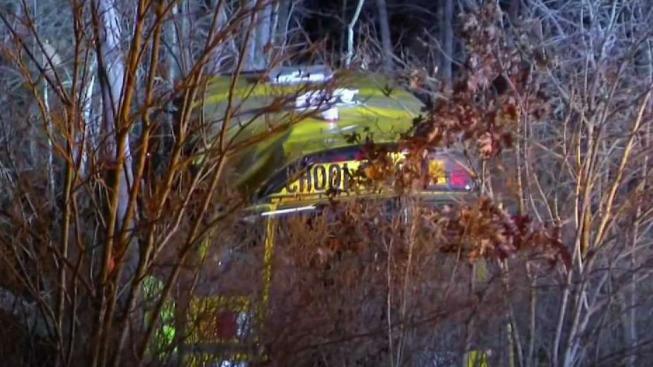 According to state police, the bus contained parents and children who were returning to Tiverton. Gilpatrick was charged with OUI alcohol second offense, negligent operation of a motor vehicle, and marked lanes violation. She will appear in court on Monday. It’s unclear if she has an attorney.